Hearing loss means a loss of sensitivity to sounds that are audible to those with normal hearing. Hearing loss can also be described as a breakdown in the ear or brain’s ability to identify sounds. There are several types of hearing loss, and numerous possible causes. Hearing loss is often described by the location of where the loss occurs, the degree of hearing loss, and also the configuration (or what sounds are affected). A conductive hearing loss is due to the sound signal is not being conducted properly to the inner ear. This can occur in the outer or middle ear. (Please see “How Do We Hear” for a greater description of the anatomy.) Typically this type of hearing loss is not complete deafness, but a reduction in the loudness of sounds. It can be caused by ear wax blockage, fluid in the middle ear space, a disruption in the bones of the middle ear, and many other causes. This type of hearing loss is most likely to be mediated through medication or surgery, and will often require a referral to an ENT physician. You can read more about conductive hearing loss from ASHA’s website. A sensorineural hearing loss occurs in the inner ear, or along the pathway as sound signals travel to the brain to be interpreted. Without extensive testing, it is difficult to pinpoint whether the loss is in the cochlea (the inner ear) or in the hearing pathway to the brain. This type of hearing loss is not medically treatable but can be mediated through hearing technology. Frequent causes of sensorineural hearing loss are aging, noise exposure, ototoxic drugs, heredity. This is a great article on sensorineural hearing loss from Medline. As the name implies, mixed hearing loss has aspects of conductive and sensorineural hearing loss. Hearing loss configuration relies in part on the audiogram. 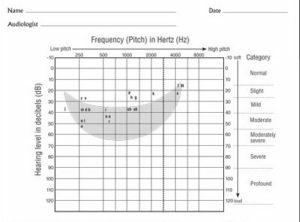 The audiogram is arranged so that frequency or pitch runs from low to high tones, and loudness (measured in decibels) along the long axis. As you move from left to right, you go higher in pitch, just like on a piano. As you move down the axis you get louder and louder in volume. 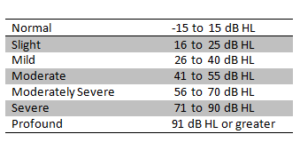 Hearing loss may occur anywhere on this chart and can be described as low, mid or high frequency. Hearing loss can also be described as bilateral (both ears) or unilateral, symmetrical (meaning both ears are similar). Hearing loss may also fluctuate or progress as well. Once we can identify hearing loss, and find a patient’s functional range of hearing, the goal is to maximize that range. During an appointment, we will discuss a range of options that will help you to get the most out of your hearing and your life. As the premier hearing care center in Rupert, ID, our team at Mt. Harrison Audiology also provides 5-star-rated hearing services to patients from Burley, Twin Falls, Filer, Malta, Kimberly, Jerome, Heyburn, Paul & Declo, ID, and surrounding areas.